This 10-9 slugfest which turned into the longest nine-inning game in National League history* will give a journalist enough copy, that will never see the light of day, to write a novel. 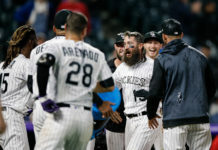 But even with four lead changes and nearly a walk-off fifth, the script for the Rockies Friday night looked quite familiar. After taking a lead in the sixth, the bullpen gave up six runs in the seventh inning, giving the D’backs their biggest run differential of 8-3. But the Rockies kept chipping away as they have continued to come back from big deficits in the last three games. If this team were bad, they would have lost by that score. Filling the gap to win is what will give the Rockies the chance to be competitive come the trade deadline. For Carlos Gonzalez none of that past few days mattered as he came to pinch hit in the eighth inning and hit a double to score the go-ahead run. Entering the game he was hitting .138 in his career as a pinch-hitter. Walt Weiss said to start the game, Gonzalez was 50-50 whether he’d even play his All-Star or not coming off a slight wrist injury the night before. Cargo said the game dictated that he was meant to play. 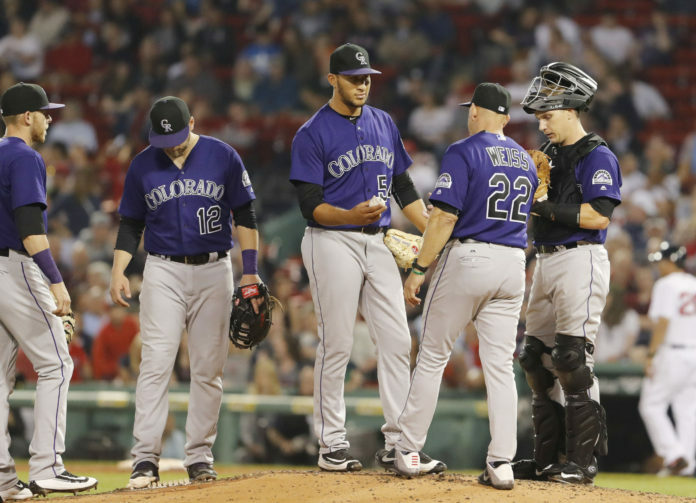 The manager and his team, without prompt, continue to defend their young closer, Carlos Estevez, who was unable to hold consecutive leads in the ninth. “Estevez has been pitching pretty well. Just two bad outings yesterday and tonight, and we believe in him, and we’re not going to point any fingers because a lot of guys had a bad game, just the way I had a bad game yesterday,” Gonzalez said. Yasmany Tomas hit a game-tying home run off Estevez that he said he missed over the plate middle away instead of up in the strike zone where Nick Hundley wanted. Estevez said otherwise he was confident he made good pitches the rest of the way. What got lost in all this resiliency was the resiliency of starter Tyler Anderson who gave up eight hits but limited the damage to two runs and gave the Rockies another solid start. He became the second Rockies pitcher to go five or more innings and allow two or less runs in his first three career starts (Jason Jennings was the other). Hundley said the young lefty has a ways to go, but he’s done well for the team so far. In the ninth, Hundley hit a monster shot that looked like the walk-off homer but too much topspin and a remarkable catch by Ricky Weeks Jr. alluded the team of the break they so desperately needed. The Rockies have scored 23 runs in the past three games but haven’t come away with a victory. All these runs may seem wasted but not for Hundley. The team now is in fourth place in the NL West standings — not to mention, the first place Giants are 31-9 in their past 40 games, which is their best span going back to when they were the New York Giants. The Rockies went 4-for-26 with runners in scoring position and left 16 runners on base, which is the most since 2013. This team needs amnesia quick, and they need to take the advice of their veteran. For the sake of the Rockies, let’s hope game three of this series works and not like the last three games.